Perched on the summit of the cape of Kalithea looking across the scenic bay of Kalithea and the sandy beach, Kalithea Horizon Royal offers spectacular views of the sea and the sandy beach, which is within walking distance and can be reached by foot. The central location of the hotel makes it a good base for sightseeing, as it is close to the town centre of Rhodes, the Rhodes harbour, Faliraki and the renowned Baths of Kalithea. Surrounded by lush gardens, the hotel provides well-appointed, comfortable rooms overlooking the Aegean Sea, Kallithea Bay and Rhodes town. But the hotel also appeals to those who are looking a fun and activity-oriented holiday. There are three outdoor swimming pools on three levels along with cascading waterfalls between each pool, plus a kid’s pool and open-air Jacuzzi. Sun seekers can lounge on the hotel’s private pebble and sandy beach or try scuba diving. There are also a clutch of outdoor sports and indoor games for both adults and children, as well as mini club for the young guests. 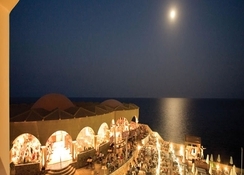 Dining choices include buffet restaurants, snack pool bars and a taverna-style place overlooking the beach. 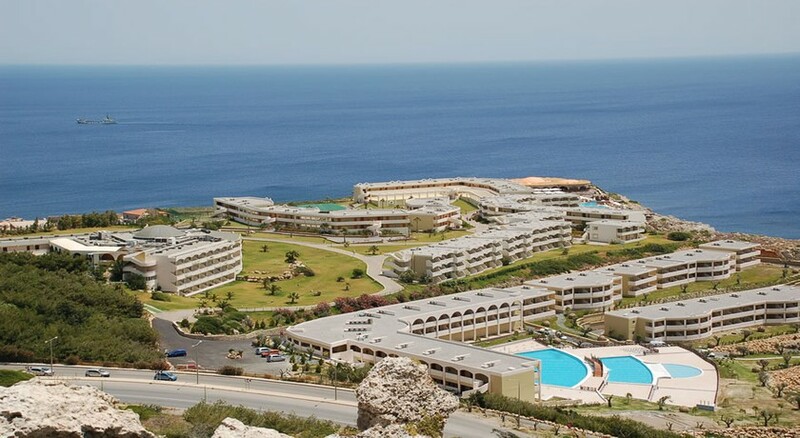 The hotel enjoys a hilltop location overlooking Kalithea Bay, the azure Aegean Sea and across the Rhodes town. The private beach of the hotel is just a few minutes’ walk (750 metres) downhill, while the town centre of Rhodes is a 10-minute drive (6 km). Kalithea Horizon Royal is also within easy access to the major attractions of the area. The famous Baths of Kalithea (Kalithea Springs) are a 15-minute walk away (800 metres). The distance of Rhodes harbour from the hotel is 5 km and the Rhodes Airport is located 15 km away. There are also several Greek villages nearby, such as Koskinou (2 km) and Faliraki (4 km). Golf enthusiasts can visit the nearby 18-hole golf course in Afantou, just 10 km away. Kalithea Horizon Royal offers a choice of well-appointed, comfortable and spacious rooms and suites that offers panoramic vistas of the Aegean and Kallithea Bay, all the way to the Rhodes town. Built in Aegean-style architecture, the room decor creates a serene and soothing ambiance and the guest rooms come fitted with all modern amenities. Rooms are categorised into standard rooms, superior rooms, superior sea-view rooms, family rooms, junior suites, royal suites and royal plus suites with fantastic sea views. Facilities include air-conditioning (May-October), satellite TV, direct phone, radio, fridge, hairdryer, balcony, tea and coffee facilities, bathrobes, slippers and DVD-CD player. Royal suites come with added amenities like marble bathroom, upgraded furnishings, lounge area, flat screen TV and DVD player in both the two bedrooms and fruit and wine on arrival. Royal plus suites also have two bathrooms and a walk-in wardrobe. The hotel’s main restaurant Athina provides breakfast and dinner in buffet-style, along with added amenities like live cooking and theme dinners. For lunch, guests can head to the tavern-snack Poseidon or the pool bar Aphrodite. You’ll also get snaks throughout the day, ranging from hot snacks (Greek puff pastry and pizza), cold snacks and midnight snacks. If you’re planning a day trip, the hotel can arrange a picnic basket. Local and international alcoholic and non-alcoholic drinks are served at the main bar Helios, while the lounge bar Appolo offers coffee, tea, ice cream and other beverages. Since Kalithea Horizon Royal shares facilities with the Kalithea Mare Palace next door, guests can also visit the latter’s main restaurant Thalassa, snack-bar Delfinia, main bar Kalithea, as well as the beach snack-bar The Rock. 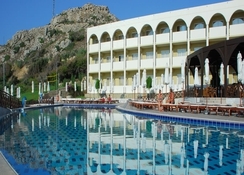 Kalithea Horizon Royal hotel, Rhodes offer an array of sports and entertainment options. There are three outdoor swimming pools on three levels with cascading waterfalls between each pool, as well as an open-air Jacuzzi. The young guests can enjoy themselves at the children’s pool or let off some steam at the playgrounds. There’s also a mini club and a games room with table tennis and video games. Adults can relax on the hotel’s private pebble and sandy beach, where you can also take scuba diving lessons. The beach is 180 metres from the reception and a shuttle bus can take you there. For sports enthusiasts, the hotel offers tennis court, mini golf, football court, archery, basketball, volleyball, beach volleyball, as well as a fully equipped gym. An 18-hole golf course is also available in Afantou, 10 km from the hotel. If you want complete relaxation, check out the open-air Jacuzzi by the pool or the hotel’s sauna. Distance to the beach: 750 metres; time taken (walking): 10 minutes. Distance to the Rhodes town: 6 km; time taken (driving): 10 minutes. Distance to Rhodes harbour: 5 km. Distance to Rhodes Airport: 15 km.